A corporate MOOC can be an incredibly effective way to tackle your organization's most important strategic priorities, and make both your leadership and your learners cheer. Our clients using the Intrepid platform in the corporate MOOC configuration have seen enormous success leveraging the MOOC model for cohort-driven learning at scale directly aligned with their organization's biggest strategic initiatives. Well, we suggest kicking off with this infographic, a handy guide we created to help you determine if your learning initiative is a good candidate for a corporate MOOC (or if it's better suited to an ongoing online performance support program such as the Intrepid Learning Hub configuration instead). Did you get to the end zone? 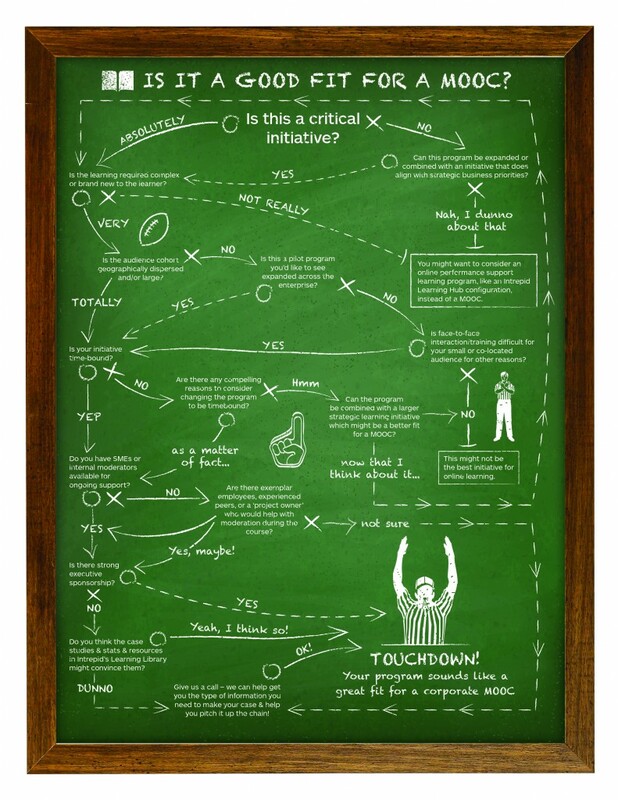 If so, your next move (after a little end zone dance, naturally) should be to download our new Business Transformation MOOC Playbook to find out just how to run a corporate MOOC. The playbook walks you through the steps of effectively executing a corporate MOOC that'll win the learning game for your learners and your organization.